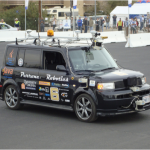 The 2007 DARPA Urban Challenge held out a $2M prize to the team that could build a fully autonomous self-driving robotic car to navigate over 60 miles of a city-like driving environment. Perrone Robotics once again spearheaded semi-finalist Team Jefferson with “Tommy Jr.”, a Scion xB driving completely under Perrone Robotics’ MAX-based software platform. Perrone Robotics’ reformed and and re-led “Team Jefferson” with a new vehicle named “Tommy Jr”. The team once again operated on a limited budget and man-power. However, this time, with additional support from sponsors such as Sun Microsystems and team partners such as the University of Virginia, Tommy Jr. met the increased challenge and made it again back to the semi-finals. With an operating budget still at 1/100th of that of other teams, less than two man-years of software development time, and leveraging low-cost COTS hardware, the team still managed to place roughly in the middle of the pack pitted against the competitive field. This year, not only leveraging the MAX platform, the team also could leverage a few key MAX extensions. These included a rich sensor driver for SICK LMS lasers (MAX-LMS) and a framework for Unmanned Ground Vehicle functionality (MAX-UGV). MAX-UGV’s building blocks for self-navigation and obstacle avoidance were extended to include more sophisticated rule-based maneuvering to deal with the varied circumstances of autonomous city driving. After all was said and done, an enhanced suite of general purpose MAX software tools for autonomous driving operations was produced and the opportunity to showcase how much could be done with less money, less man-power, but a robust and comprehensive robotics and automation software platform.